A Companion to Julius Caesar comprises essays from leading scholars examining the life and after life of this great polarizing figure. 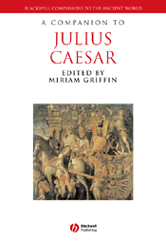 This title : Explores Caesar from a variety of perspectives: military genius, ruthless tyrant, brilliant politician, first class orator, sophisticated man of letters, and more. It utilizes Caesarâs own extant writings and examines the viewpoints of Caesarâs contemporaries and explores Caesarâs portrayals by artists and writers through the ages.